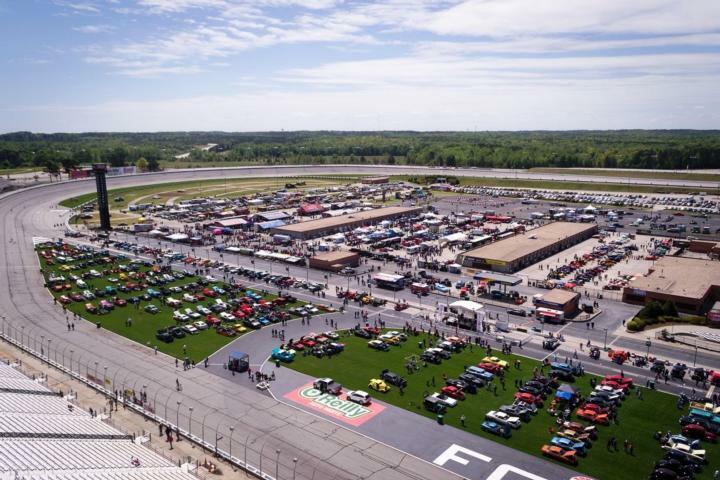 One of the largest automotive festivals of its kind in the South, the 5th Annual Summit Racing Equipment Atlanta Motorama, returns to Atlanta Motor Speedway this Saturday and Sunday with acres upon acres of motor-centric events and attractions for auto enthusiasts of all ages. With so much going on and just two days to take it all in, AMS has gathered its top 14 can't-miss attractions for fans attending this weekend's show. Returning for its fifth straight year, fan-favorite BIGFOOT® monster trucks will be back with twice-per-day car-crushing exhibitions in the Extreme Motorsports area, along with the famous No. 5 truck and its gigantic 10-foot tires. Now it its second year, Atlanta Barbeque Classic will add some extra flavor to the massive automotive show with a barbeque-cooking contest heralding some of the best cooks in the South. Show attendees can taste five one-ounce samples for just $5, with all revenue going to benefit Speedway Children's Charities, helping children in need in the local area. The cook-off winner will take home $10,000! Yes, BIGFOOT® will be back in action, but so will Sasquatch! It's a gigantic 4x4 monster truck specially equipped with passenger seats for a thrilling, heart-pumping ride atop its massive tires and jacked-up chassis. Sasquatch will be located next to BIGFOOT in the Extreme Motorsports Area, and rides are just $10 apiece. With a name like Million Dollar Salon, you won't want to miss the extremely rare and valuable museum-quality vehicles staged inside the Marcy Scott Media Center. This year, it's all about exotics. See high-dollar imports like McLarens, Ferraris, Lamborghinis and more. Calling all Autobots! Come see the world's first fan-built replica of Optimus Prime® from the "Transformers" film franchise! It might not be a real-life transformer, but the detail of the truck is nothing short of exquisite, exactly like it was in the movie. More than 20 high school teams from across the Southeast will tear apart a full-sized car engine and put it back together in a matter of minutes, as they compete against the clock for the top time and a spot in the dual national finals later this fall. Show attendees seeking a part or accessories for their current vehicle project or just enjoy browsing the countless booths full of auto-themed trinkets will find everything they ever needed and more at the sprawling Pull-A-Part Swap Meet located adjacent to the Extreme Motorsports Area. One of the main attractions at the Summit Racing Equipment Atlanta Motorama, the Georgia Power Show Car Garage, features dozens of nationally acclaimed award-winning vehicles from all decades going all the way back to the 1930s. This year, six of the esteemed Great 8 cars from the prestigious Detroit AutoRama will be on hand. Visitors in the market for a classic or custom car to call their own can visit the on-site Collector Car Auction located on the grandstand concourse. Bidding cards can be secured each day from the auction tent. 5. Russian Tupolev 007 "Spy Boat"
It looks like something straight out of a "James Bond" film, but the Tupolev 007 is a real-life amphibious vehicle built by the Russians in the 1960s to retrieve cosmonauts landing in the Siberian wilderness from their outer-space missions. The "007" boat attending the Atlanta Motorama was the very first one built by Russian engineer Aleksei Tupolev and is in near mint condition. Nearly every major automotive brand will be represented at the gigantic vendor midway, where custom and professional parts and services will be available to visitors. With more than 40 professionally trained pinstripers slated to donate their unique talents at this year's Atlanta Motorama, the Pinstripers Panel Jam will be the largest ever gathering of these artists in the South! The stripers will decorate everything from bowling pins to aluminum automotive panels and then donate them to be sold at auction later in the day to benefit the Atlanta Chapter of Speedway Children's Charities. There's nothing like flashy, loud drag-racing cars at an auto show, and the Southeast Gassers will not disappoint. Built to drag-race competition standards from the 1960s, a dozen of these iconic race cars will be on display at this weekend's show and will even crank up a time or two for a guttural, chest-thumping experience like none other. It's the real thing. The actual RV, a character unto itself, from the classic American Christmastime film "National Lampoon's Christmas Vacation," will be on hand in the vintage trailers area for fans to tour and snap pictures. And no, the you-know-what is definitely not full. The 5th Annual Summit Racing Equipment Atlanta Motorama, Georgia's gigantic motoring festival celebrating anything with an engine, returns to Atlanta Motor Speedway this Saturday and Sunday at 9 a.m. each day. Spectator admission is just $12 for adults, $5 for kids ages 6 to 11 and free for children 5 and under. For more information, visit www.atlantamotorama.com or contact the Atlanta Motor Speedway ticket office at (770) 946-4211 or (877) 9-AMS-TIX.